Performance (Oxford: Hart Publishing, forthcoming 2019). When India embarked on market-oriented reforms in 1991, there was a desire to break with central planning; with detailed government control of entry barriers, product design and processes within firms. This is not synonymous with deregulation: there are market failures in many industries that require addressing. This led to the establishment of regulators. While the Reserve Bank of India has existed since 1934, there was a wave of establishment of new regulators after SEBI was created in 1988. The early optimism about shifting from central control to specialized regulators has given way to concerns about the working of regulators. Regulators have also been plagued by poor State capacity. Regulators have too often veered into controlling as opposed to regulating, with creation of entry barriers and micro-management through regulations. Firms and groups of firms actively seek to co-opt regulators in their business objectives, which has given a return to the political economy of central planning. Entry barriers have sprung up with irrational and arbitrary decisions in licensing. Enforcement of regulations and substantive lawmaking is selective and weak. This has induced large costs upon the economy. There is arbitrary power to initiate investigations and punish, and a climate of fear where private persons are afraid to criticise regulators. India of 2018 is uncomfortably similar to the India of 1991. 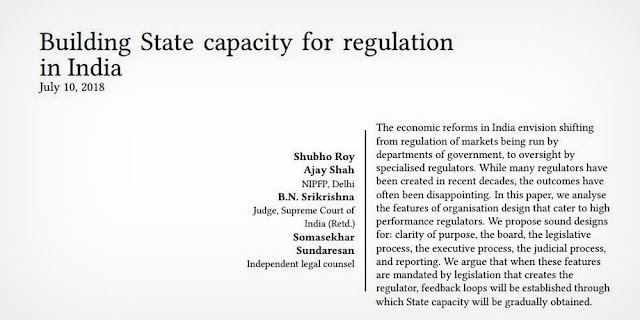 It is hence important to review the Indian experience, diagnose the sources of failure of existing regulators, and envision how high-performance regulators can be obtained. We have a new paper, which is forthcoming in Regulation in India: Design, Capacity, Performance, edited by Devesh Kapur and Madhav Khosla, Oxford: Hart Publishing, 2019 (forthcoming). This article summarises and introduces this new paper. The second non-solution is a focus on personalities. When institutions are weak, the character of the institution is determined by its staffing. There is, then, a clamour to recruit great men, and then give them all power to do as they like (i.e. extreme regulatory independence). It is important to look deeper, to build institutions that have the impersonal capability. For any change to be more than skin deep, it cannot be an idea in the minds of certain individuals; it has to be about the formal structures of governance, accountability, and processes. Conversely, individuals working in regulators sometimes take criticism personally. However, the failures of an organization are primarily induced by the design of the organization. The same individuals would deliver superior outcomes if placed in a better-designed organization. The focus must be on the incentives of the individuals who man the regulator. If regulators are merely given arbitrary power, public choice theory and the Indian experience shows that this power will be used poorly. What is required is "systems" of accountability, and checks and balances, through which the individuals working inside regulators have incentives to do the right things. This requires seven elements. Clarity of purpose. Accountability for an organization requires clarity on its goals. Every regulatory organization must have a compact and clearly understood the objective. Sprawling mandates and particularly conflicting mandates yield poor performance. Role and composition of the board. The board must be dominated by non-executive members, through which the board can play the role of the Principal vis-a-vis the management which is the Agent. The board must control the organization design, including organization diagram, internal process manuals, and the budget process. The board must control the legislative function. Executive process. Sound processes are required in licensing and investigations, which protect citizens from arbitrary power. The non-award of a license causes harm to the applicant and should use processes similar to those employed when punishing a citizen. Judicial process. An administrative law department should contain administrative law officers, who play no role in legislative or executive functions. This would yield an element of separation of powers. A hearing must take place before an administrative law officer, where the prosecution leads an argument and the defendant is given an opportunity to argue her case. This should lead to the drafting of a reasoned order as a structured document which shows the state of law, the facts of this case, demonstrates that law has been violated, or explain why this conclusion cannot be reached, and uses proper reasoning to determine the penalty. Orders should be published. There should be the possibility of efficacious appeal at a court or tribunal against the order. These three stages of the due process (internally, at the administrative law officer, and externally, through publishing orders and at the appeal) create pressure upon the investigation and prosecution staff of regulator to produce high-quality work and protect citizens from arbitrary power. Reporting and accountability. Regulators should be obliged to release statistical details about their functioning. Reporting should not concern the broader economic environment, e.g. the fluctuations of the stock market index, but should focus upon the actual work of the regulator, e.g. the win rate at the tribunal when orders are appealed. High-quality reporting of all aspects of the working of the regulator will create the pressure of accountability, and feed into the budget process where targets can be set and incremental resources allocated in a way that pursues those targets. The role of the department. Alongside the creation of well-structured regulators, there is a need to clarify the role of the department of government, and create capacity in the functions that the department has to discharge. When compared with these seven elements of the design of a regulator which foster high performance, the present Indian landscape contains large gaps. The regulators of today are defined by skimpy laws, which give arbitrary power to the management, and lack a Principal-Agent perspective upon the working of the regulator. The present legislative framework is grounded in the notion that regulators are good people and will work towards the welfare of the people. This creates poor incentives for good behavior by regulatory officials. This article was originally published at Dr. Ajay Shah's blog on July 17, 2018.